Chris Edmonds, pastor of Piney Grove Baptist Church in Maryville, Tenn., just outside of Knoxville, knew little about his father’s service in World War II. His father, who died in 1985 at age 64, rarely spoke about his service, so his family had no idea about his heroism. Now, thanks to a handful of people who survived because of a decision Chris Edmonds’ father made, Master Sergeant Roddie Edmonds is the first United States serviceman recognized as Righteous Among the Nations for saving Jewish lives during the Holocaust. Yad Vashem, Israel’s Holocaust Martyrs and Heroes Remembrance Authority, made the designation on Dec. 2. He is only the fifth American so recognized, with Varian Fry, Waitstill and Martha Sharp, and Lois Gunden. Chris Edmonds was in Israel at the time, attending a seminar sponsored by the International School for Holocaust Studies for Christian leaders. There will be a ceremony honoring Roddie Edmonds on Jan. 27 at the Israeli Embassy in Washington. Almost all of the Righteous Among the Nations have been honored for saving European Jews from the Holocaust, by hiding them or using diplomatic tricks to get them out of harm’s way. 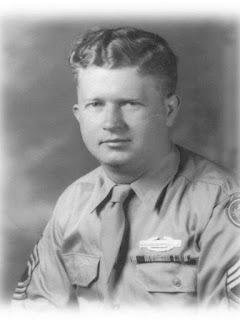 Making Roddie Edmonds’ story unique is that he saved the lives of American Jewish soldiers who would likely otherwise have been killed by the Nazis. Knoxville native Roddie Edmonds shipped out as part of the 422nd Regiment, 106th Infantry Division, in December 1944, and within five days his regiment was captured in the Battle of the Bulge, on Dec. 19. They arrived at Bad Orb, a prisoner of war camp, on Dec. 25. A month later, he and the other noncommissioned officers were sent to Stalag IX-A with over 1200 other soldiers. He was the senior noncommissioned officer among them, so he assumed the leadership position. On the first day, an order came out over the intercom — after roll call the next morning, only the Jewish prisoners were to fall out. By then, the Nazis weren’t just exterminating Europe’s Jews, they were doing the same to captured Jewish soldiers from Allied armies. Edmonds instructed his men that the next morning, everyone would fall out, saying that the Geneva Convention states they need give only name, rank and serial number. Instead of shooting, the commander put his gun away and stormed off. It is estimated that there were 200 Jewish soldiers among the prisoners. But that wasn’t the end of the odyssey. One day the Germans told them that the next day they would be leaving and marching further into Germany. With the prisoners near starvation, Edmonds instructed them that they would not leave with the Germans on a death march — act sick, get sick, run to the barracks, just do not go with them. Despite being threatened with being shot, they followed Edmonds’ orders, until the Germans finally threw up their hands and left the Americans behind, taking the French and British prisoners with them. Once the Americans were alone in the camp, Edmonds had to convince them not to leave, that they could not survive on their own beyond the gates. The next day, the Third Army found the camp and rescued them. Roddie Edmonds had two diaries he kept during that time. One had names, dates and addresses for many of the men under his command, and some notes about life as a POW. The other book had the complete plans for a restaurant, the Jolly Chef, that he and three fellow prisoners designed, including floor plans, menus and pencil drawings. “They were starving to death so it was a way to dream about better days ahead,” Chris Edmonds said. In 2009, Chris Edmonds Googled his father’s name to see what he would find about his service. To his surprise, his father was mentioned in a 2008 New York Times article about Lester Tanner, a New York attorney who sold a home to President Richard Nixon in the 1970s, when nobody wanted the disgraced former president as a neighbor. That led Chris Edmonds on a journey to find Tanner and other POWs who were there. At the first meeting, Tanner told him that his father deserves the Medal of Honor. He has since met with Congressional representatives in Tennessee and the ball is rolling — albeit slowly — for that recognition. He also met Larry Goldstein, a friend of Tanner who unbeknownst to him was gathering information on Roddie Edmonds to submit to Yad Vashem. Chris Edmonds said it is difficult to get a Righteous Among the Nations designation from Yad Vashem, but “there was no question” in this case.